Dr Peter Harries describes himself as “an entertainment host, poet, musician and raconteur”. He is a well known Perth celebrity, having spent many years in the TV and entertainment industries, among many others ventures. 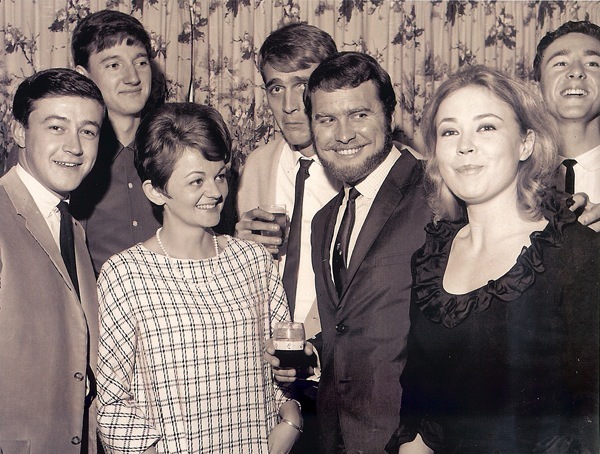 Though Peter gained formal training in television techniques, it was in front of the camera and on stage that brought him to the public’s attention, appearing in, presenting or producing shows for STW Channel 9 in Perth from 1965 to 1970. 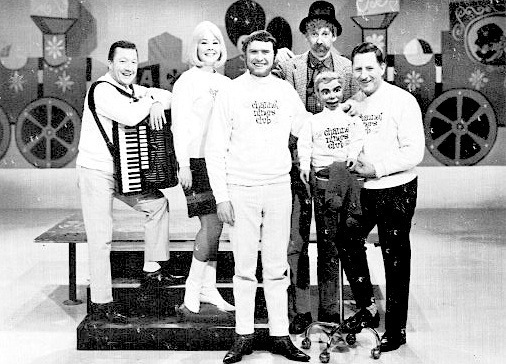 Such shows as the adult satirical program ‘All My Eye and Betty Martin Too’, hosted by Buddy Clarke and the daily Channel Niners Club with musician Peter Piccini, Veronica Overton, Station News-reader Alan Graham (Useless Eustace), Pixie Hale and Ron Blaskett with ventriloquist doll Gerry Gee. 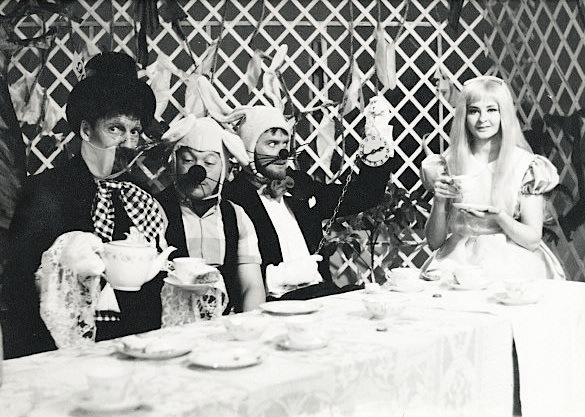 Actress Pixie Hale appeared on a regular basis as required to play such characters as Alice in a serial production of Alice in Wonderland, on the Channel Niners Club during Christmas 1966. 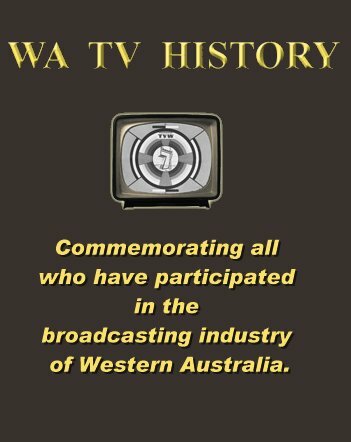 In the early days, there was also ‘Peter Harries Presents’, ‘Charlie, Punch and Me’ on Tuesdays, ‘Under The Coolabah Tree’ on Thursdays and and ‘On The Wharf’ on Fridays. Then the STW-9 Christmas Pantomime, ‘The Golden Hind’ with cast Alan Graham, Peter Piccini, Pixie Hale, Gerry Gee, Ron Blaskett, Jeff Newman, Veronica Overton, Peter Harries and Lloyd Lawson. 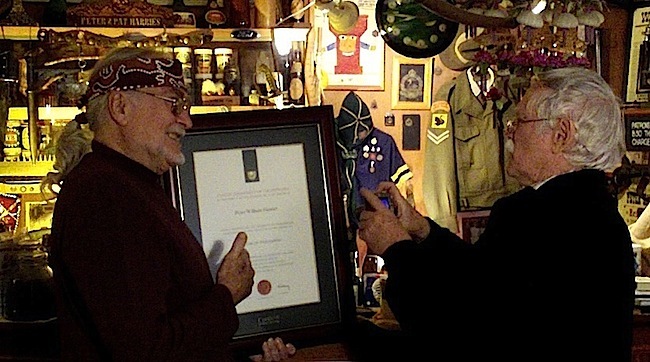 In 1966, Peter instituted a daily discussion program with Jeff Newman called ‘Shoes and Ships and Sealing Wax’. 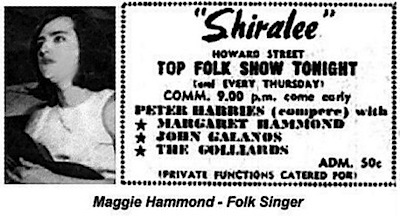 Meanwhile, Peter was also hosting folk evenings at the Shiralee in Howard Street, Perth, which attracted a strong following. These evenings introduced an outstanding young singer, Margaret Hammond, who also worked with Peter on a Channel 9 children’s program, giving her Joan Baez style interpretations of children’s songs and traditional ballads. The following photograph of STW-9 related folk was taken in 1966. The bloke on the left is Alan Graham, the station newsreader at that time and also my off-sider Useless Eustace on The Channel Niners Club! The doleful one is Eddie Townsend, a News director who was sacked by Bill Bowen for electronically turning LLoyd Lawson upside down during a News break, thereby causing him to utter an expletive just as he went back on-air! Eddie went on to become a most successful Real Estate Agent in the Morley area – a great bloke! Jeff was not then married to Pat and we were at a 21st Birthday Party for a lovely girl named Kay Aubrey, a trainee air hostess, who was killed in a plane crash at Port Hedland on 31st December 1968. She was previously a secretary to the News Department. The next photo shows the Channel Niners Club Team in September 1966. STW-9 also conducted children’s talent shows, one was called ‘Junior Spotlight’, with Trevor Sutton and Jenny Clemesha (Seaton) as comperes. Judges included Mike Brand, Geoff Harvey and Peter Harries. In the early 1970’s, STW-9 produced a 30 minute panel quiz-type program called ‘I’ve Got a Secret’ compered by the station newsreader Peter Barlowe. Panellists included newspaper scribe Robin Oliver, potter Joan Campbell, comedian Don Martin and entertainer Peter Harries. The panel tried to discover by questioning, the ‘secret’ of visiting and resident celebrities. During the Vietnam War (1962-1972), Peter performed and compered the first Western Australian Concert Party to entertain the Free World troops (Australian and American) in South Vietnam, as part of official government Australian Forces Overseas Fund, 1968. 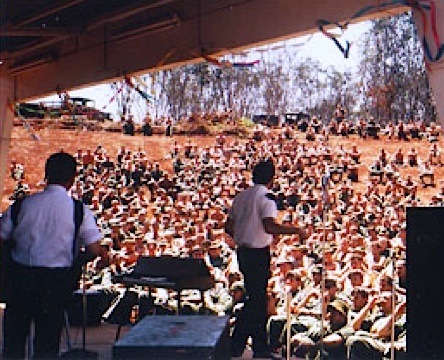 A large crowd of troops were entertained by singers Kelly Green and Michelle Edwards, entertainers Ron Blaskett and puppet Gerry Gee, teenage singers John and Shirley Ried, comedian Peter Harries and musicians John Hunter, Guy Bart and Peter Pichini. Peter was also the manager, producer, performer and compere of a similar Concert Party in 1971. On leaving STW, Peter formed a partnership with noted singer Kelly Green. Together they operated one of Perth’s most popular Theatre Restaurants, THE KNIGHT KLUB in South perth for 16 years. Since 1975, Appealathon has raised over $60m for it’s beneficiaries. The Appealathon is involved in over 50 fundraising events and projects across Perth each year. As an entertainer, Peter continued to make regular appearances on both TVW-7 and STW-9 in the 1970’s, 1980’s and 1990’s, whilst also making personal contributions to both Telethon and Appealathon between 1968 and 2000. 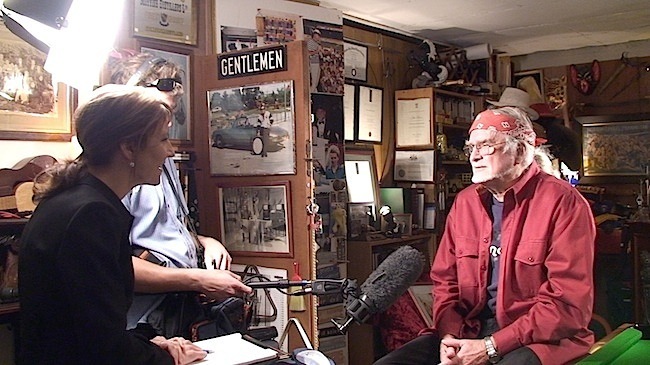 During the 1980’s, Peter Harries appeared on the Jimmy Hannan hosted ‘Mike Walsh Show’ to talk about his open heart surgery and the making of the documentary titled “Heart Stopper”, filmed during his first open-heart by-pass surgery in 1981. Peter’s heart procedure has been repeated twice, 1988 and 1998. The video was subsequently used for educational purposes for prevention of heart disease on television and as an aid in teaching hospitals. This is a VERY belated thank you, Dr. Harries, for your travel to Vietnam to entertain the AAATV and US military. I had the pleasure of enjoying your music, along with Michelle Edwards, Kelly Green, and Shirely Read, when you performed for the ANZAC Day observance and celebration in Da Nang in 1968. Many, many thanks for a bit of respite during some pretty harrowing times. I’ve meant to contact you over the years after meeting your son Jamie at Zenith’s. Myself and Glenn Ryan remember you fondly from our appearances on the CH9ers Club as 12yo child ventriloquists. We were invited on the show by Ron Blaskett as a one-off which then became a regular CH9ers Club slot for Glenn and myself for a long time. 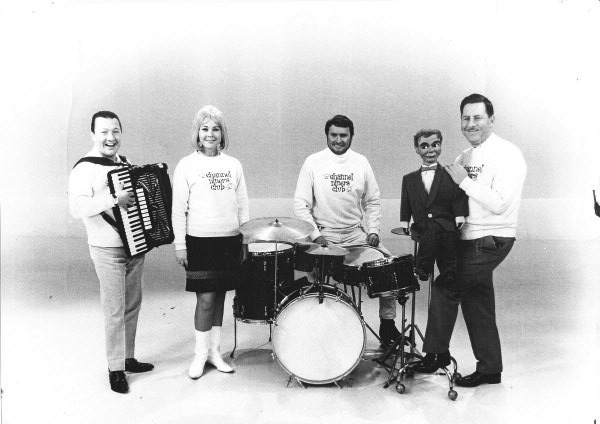 Myself and Paul Howson later did a regular marionette segment on the show – “Bobo & Boss”. I remember you as being very warm, encouraging, and a great entertainer for kids; the CH9ers Club was very popular due to the warmth and fun of the whole team. Congrats on your PhD too! Thank you Patrick! 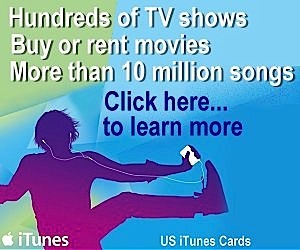 Please become a friend on Facebook. read your thesis on the internet, or is it available else where. The Pinjarra Tigers are Premiers this year !!!! !